Crime reporting, in one form or another, is as old as crime itself. Almost all young reporters have spent some time on this beat, and their work affects all of us. Covering Canadian Crime offers a deep and detailed look at perennial issues in crime reporting and how changes in technology, business practices, and professional ethics are affecting today's crime coverage. Social media in the courtroom, the stigmatization of mental illness, the influence of police media units, the practice of knocking on victims' doors, the culture of masculinity in the newsroom: these are among the topics of discussion, explored from various disciplinary perspectives and combined with poignant interviews and thought-provoking introspection from seasoned journalists such as Christie Blatchford, Timothy Appleby, Linden MacIntyre, Kim Bolan, and Peter Edwards. 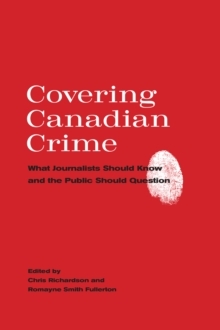 A critical account of the challenges involved in crime reporting in ethical, informed, and powerful ways, Covering Canadian Crime poses the questions that reporters, journalism students, and the public at large need to ask and to answer.